Current groups at Moonlight: THURSDAY NIGHT GROUP: Ongoing 2 hr. 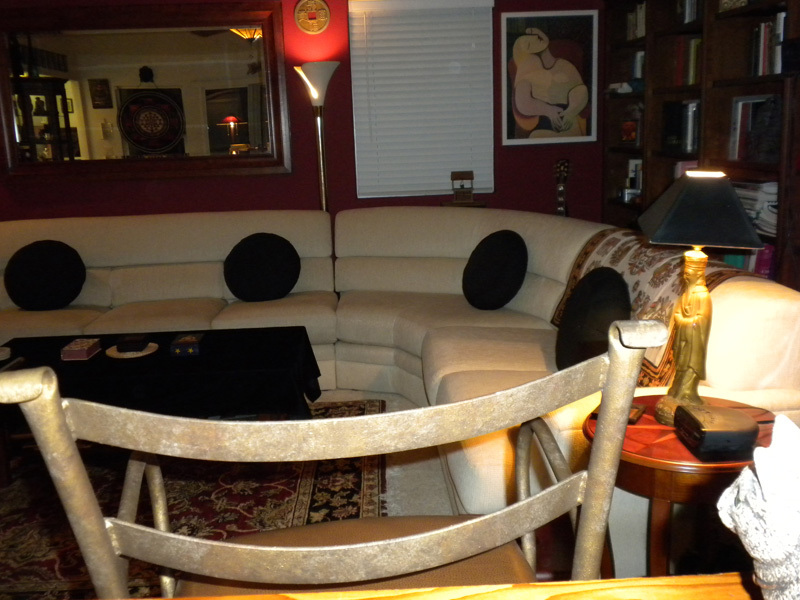 weekly GROUP THERAPY sessions ($30 – $40). 7-9 PM. Supportive, open, interactive, friendly; ongoing c0mmitment, adults. If interested contact Dr. Rosengarten about joining. Limited to eight. 1-760-944-6710 . Also, THE DIVINATION CIRCLE (MeetUp) on alternate Tuesday evenings, 7:30 -10 PM. Drop-in. $20-30. Contact Art Rosengarten for more information. Cool site. Although I have been a member for a “few months” or so, I have not been interacting? I noticed an email in my “other email account” where someone, it may have been you, asked about people being involved in this Yahoo!group. I apologize for not interacting more in the past, but all’s we have is NOW. So if it was you that wrote that email, I am ONE.. that is interested. But being on the sidelines is not being in the game. So I am going to take a proactive attitude. May the God(s) be with THEE ! ! ! !! Hello, I am interested in learning more about having a personal tarot reading. Please contact me at email above. Thank you kindly, Nichole. That was a great discussion in San Mateo last night, Art! How can I e-mail you my hidden cognitive mode paper? I think my ENTP corresponds to the Knight of Wands, but I don’t see how to work in my hidden cognitive mode Introverted iNtuition IN_J. The Queen of Wands (INTJ) is close, but it carries an auxiliary E_TJ mode that I don’t have. My modal personality approach may not quite fit the Tarot model, except for 4-mode people. I would appreciate a reading. Your reading sent by email will be welcomed. Will provide you with my Visa number. Please let me know when you would be available as I am not always here. I listened to you on Coast-to-Coast last night. 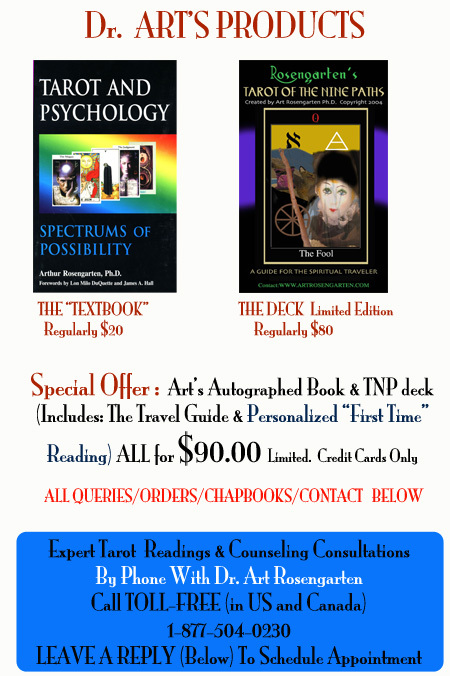 Many years ago, I was a clinical psychologist and utilized Tarot cards in counselling sessions. I found them to be extremely useful especially with children; teenagers and young adults…it helped to open “pathways” to deep problems which couldn’t be approached in conversation alone. With adults, the Tarot was approached with curious humor, but I found it was a gateway to deep sub-conscious matters. I was questioned about using this method, but I was never told not to since it did help my clients. One client I had was a 5 year old little boy who had stopped talking and showed visible signs of hating his mother. His parents took him to every doctor and psychologist and finally decided to give the local clinic a try and I was the one who met with the child. He was totally withdrawn and I pulled out the Tarot deck and told him to pick out cards that “talked for him”. He looked at each card and chose the Queen of Swords and the Death card. I asked him: The Queen is your Mommy? Do you want her dead? From that, we were able to determine that the Mother was abusing the child physically and psychologically and the child was removed from the home to live with his paternal grandparents. The Father divorced the Mother, got custody of the child and everything progressed to a happy future for the child. I often wonder how we would have gotten the info without Tarot cards. Psychiatrists, psychologists and the family doctor had failed, but a simple deck of cards opened the child up to talk. Toni–Interested to hear your thoughts about it. Art (You should join my discussion group, tarotpsych). Heard you last night on Coast to Coast. I have always had respect for the Tarot and enjoyed listening to you last night. I am interested in a tarot card reading probably by phone and wondered what you charge. I am interested in having a reading plus ordering your book and the deck. I have joined your discussion group as you suggested. In my studies, I found the Jung school was the most relevant and I used the Jung Tarot deck for many years for meditative purposes plus with clients. 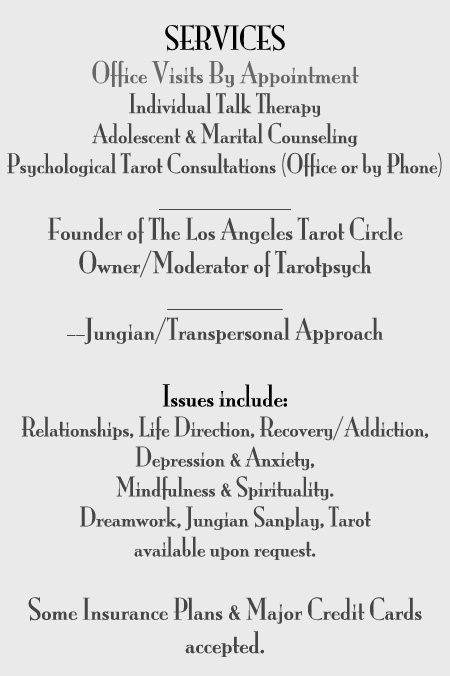 Tarot readings are, of course, if done with proper ethics, etc., are a good form of psychological help. Please contact me via email to arrange for a reading plus ordering the book and deck. I just came across this site and wasn’t familiar with you or your work until now. I’m interested in speaking with you about your $100 reading special.